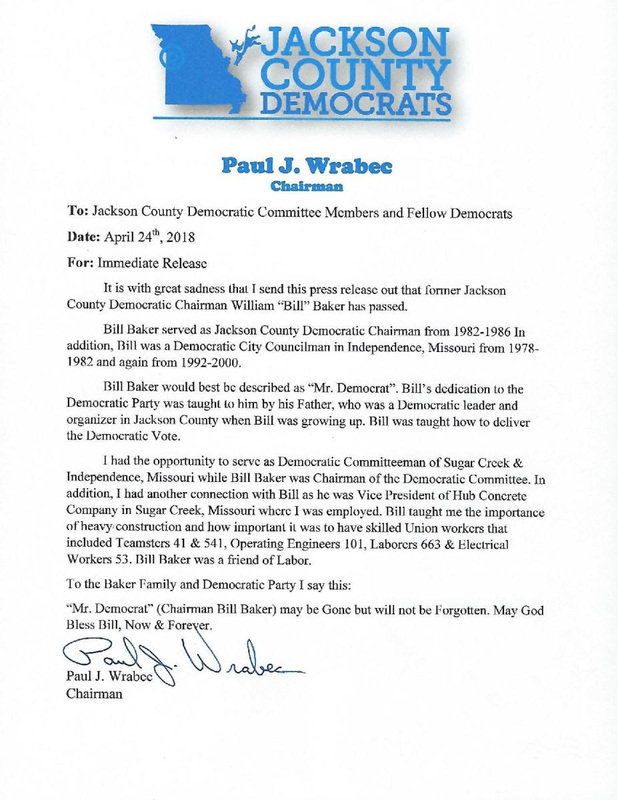 It is with great sadness that we report former Jackson County Democratic Committee Chairman and Independence Councilman William Baker passed away on April 19th. Bill was a lifelong resident of Independence, Mo. He was a community servant, Korean War Veteran and was in the loving care of the Missouri Veterans Home of Warrensburg. He was preceded in death by grandson, Mariano William Circo. Survived by wife, Shirley; children, Robin Bokarae (Sam), Mike Baker (Patty), Monica Sullivan (Pat), Tim Baker, Cindy Circo, John Baker (Elaina) and Sara Zorich (Kurt); and his 18 grandchildren; 17 great-grandchildren. A visitation will be held from 6 to 8 p.m. Thursday, April 26, with funeral mass at 11 a.m. Friday, April 27, both held at St. Mark's Catholic Church, 3736 S. Lee's Summit Road, Independence, MO 64055.
http://valwbg.org/give-to-val/give-to-val-donations. Type of Fund: General Specify: Unit D.
Also contributions can be made to the Mario Circo Mental Health Honor Fund at any Community America Credit Union.